Introducing the world's smallest string pot! 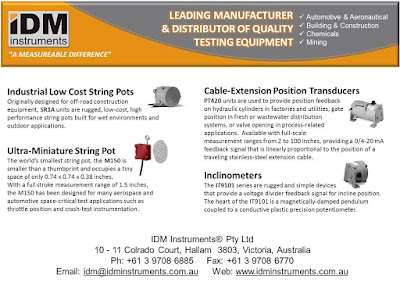 The new M150 string pot has a range of 1.5 inches, fits into tiny spaces and is the perfect position sensing solution for a variety of applications such as robotics, biomedical, aerospace testing and automotive applications. Size and Durability The M150 transducer's aluminium body measures just .74 x .74 x .38 inches and uses a .014-inch diameter nylon-coated stainless steel measuring cable. The M150 offers extremely durable construction and a high degree of reliability, with constant tension and fully retractable stainless steel measuring cable that easily attaches to the object under motion. Installation is quick and easy since cable alignment is not a requirement for efficient and effective use. The movement of the M150's internal spring-loaded spool turns the potentiometer which, when connected to a voltage source, produces a voltage directly proportional to the position of the measuring cable. This string pot has been engineered for reliability to provide quick, easy and hassle-free installation for customers. While other transducers require precise alignment, the M150 is easier to use and offers quick, accurate measurements. It delivers a high-linearity voltage feedback signal by using a precision conducive, plastic potentiometer at the heart of the sensor. The M150 design was geared to meet customer needs. Every M150 comes standard with extra leader cable and an eyelit kit to allow the customer to terminate the measuring cable precisely at the required stroke position.